Copy constructors are helpful, but they aren't polymorphic. A no-argument method can help bridge the gap to keep your code loosely coupled and easy to clone. This is the third article in my Java Cloning series. In my previous articles, Java Cloning and Types of Cloning (Shallow and Deep) in Details with Example and Java Cloning: Copy Constructor versus Cloning, I discussed Java cloning in detail and explained every concept, like what cloning is, how it works, the necessary steps we need to follow to implement cloning, how to use Object.clone(), shallow and deep cloning, how to achieve cloning using serialization and copy constructors, and advantages copy of copy constructors over Java cloning. If you have read those articles, you can easily understand why it is good to use copy constructors over cloning or Object.clone(). In this article, I am going to discuss why copy constructors are not sufficient. But what if we try to refer an object of Human from a reference of Mammal? 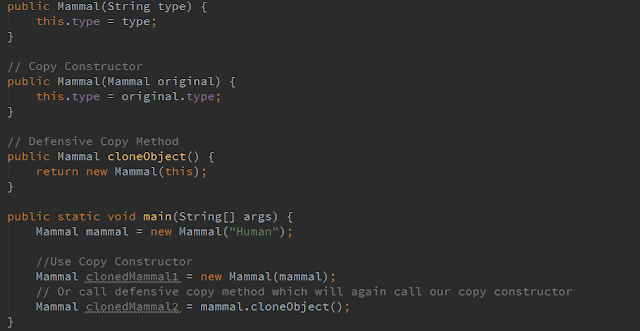 In order to clone mammalHuman, we cannot use the constructor Human. It will give us a compilation error because the type mammalHuman is of type Mammal, whereas the constructor of the Human class expects Human. As we can see, copy constructors suffer from inheritance problems and are not polymorphic. So how can we solve this problem? Well, there are various solutions, like creating static factory methods or creating some generic class that will do this for us—the list goes on. But there is a very easy solution that will require copy constructors and will be polymorphic as well. We can solve this problem using defensive copy methods—a method we are going to include in our classes and call copy constructors from. Defensive copy methods will also give us the advantage of dependency injection. We can inject dependencies instead of making our code tightly coupled. We can make it loosely coupled, we can even create an interface that will define our defensive copy method, and then we can implement it in our class and override that method. And for last two sys outs, we will get the below output, which is our expected behavior. As we can see, apart from getting the advantage of polymorphism, this option also gives us freedom for passing any argument. You can find the complete code in my CopyConstructorExample Java file on GitHub, and please feel free to give your valuable feedback. Published at DZone with permission of Naresh Joshi , DZone MVB. See the original article here.